Award winning Director, Ram Alladi has released his critically acclaimed heritage documentary, Chiseled, for general release. New York based Alladi was born in Warangal aka Orugallu which is reflected in his passion for themes of culture, architecture and heritage within his work which focuses on descriptive narrative as well as atmospheric camera work and music. A labour of love, Chiseled is Ram Alladi's debut work as a Director. 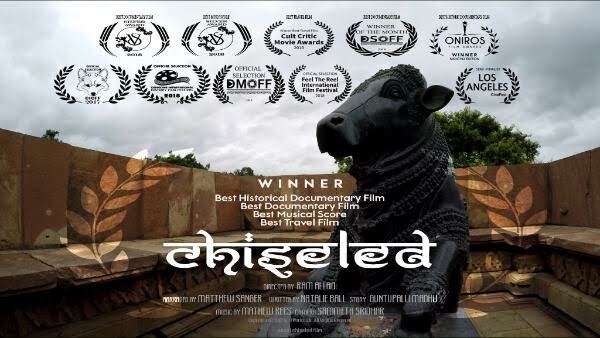 Just 23 minutes in length, Chiseled is a snapshot of the Kakatiya Dynasty in the ancient Southern Indian district of Telangana and is influenced by Alladi's own childhood recollections. Taking the viewer on a journey over beautiful lakes and spectacular temples and forts, Chiseled is a homage to the architectural and sculptural achievements of the Kakatiya Dynasty and the majesty of the region. Chiseled's stunning cinematography takes in the miracle of floating stones and earthquake proof sandboxes, fort entrances forged out of a single stone, detailed carving of the deities and mythical animals, rain harvesting tanks and much more and, allows the audience to bear witness to the incredible engineering and building skills of the Kakatiyas. In this sumptuous film, Alladi brings the ancient world to life with his documentary which is now IMDB's highest rated documentary with country of origin, India. · Virgin Spring Cine Fest 'Best Documentary Film'. · Direct Short Online Film Festival USA 'Best Documentary Film'. · Calcutta International Cult Film Festival 'Official Selection In Documentary Films'. · Feel The Reel International Film Festival, Glasgow 'Official Selection'. · Direct Monthly Online Film Festival USA 'Official Selection'. · Los Angeles Cine Fest 'Semi-Finalist'.